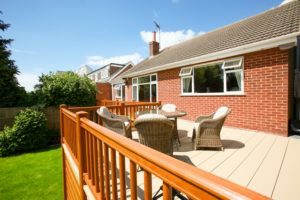 Your home is your sanctuary, your place to unwind – so choose the best quality, British-made decking system to augment its value and broaden your relaxation space. When it comes to choosing a decking system for your garden, ask for Liniar. Low maintenance uPVC decking is not a new concept – but with more than 15 years of experience in the domestic decking market, Liniar’s range is the only one that’s tooled, modelled, designed, manufactured, foiled and stocked at its own purpose-built 400,000 ft² facility in Derbyshire. Liniar is proud to be the only company to offer a fully sculptured balustrade system, along with a great variety of accessories. The Liniar brand is synonymous with outstanding innovation, style and engineering. On-going investment in development and product design, machinery and facilities ensures that Liniar is at the forefront of the most up-to-date technology. Because most components are available from stock, waiting times are kept low. This means your decking can usually be delivered swiftly to one of Liniar’s national network of approved installers, using Liniar’s own transport. With Liniar’s unparalleled attention to engineering details and price, together with an outstanding level of customer service, all at a competitive price – you can be assured of a top quality product for your garden decking. Liniar can provide a decking solution to complement the style of any garden. Create your own individually designed garden deck and enjoy the benefits of an outdoor living area. From large decking spaces adjacent to conservatories, to smaller, secluded areas – Liniar decking systems are designed to meet the needs of today’s lifestyles. Take advantage of the extra space on those long summer evenings and view the sunset with a chilled glass of wine or invite friends and family over for a meal in the open air. Liniar’s lead-free, low maintenance deck boards are available in a variety of attractive colours. These can be mixed and matched to design your own co-ordinated creation – all with an anti-slip tread for extra safety and an anti-wear finish to ensure durability. Liniar is the only uPVC decking manufacturer to provide a fully-sculptured balustrade for its deck system – with beautifully finished top and bottom hand rails and vertical pickets to put the perfect final touch to your living space.